<— Wheeeeeeee!!!!! :D!!! Famous actor fantasy come to life! Er… book-life, that is. It’s still a fantasy in the grand scheme of things, but that blurb had me excited ’cause I could already imagine all sorts of potential celebrity-stalking trouble that our heroine could encounter. And boy was it funny!!! Maryse: This one sounds like SO MUCH FUN!! The ultimate “super-fan” fantasy gone wrong? (or right?!!) 😉 …I’m in the mood for a comedy romance, and the blurb is right up my goofy-heroine alley! She wants to meet him SO BAD (he’s her favorite actor), so I have a feeling she’s going to get herself in trouble in the process. YEP. This one’s for me RIGHT NOW!!!! I’m giving it a go! 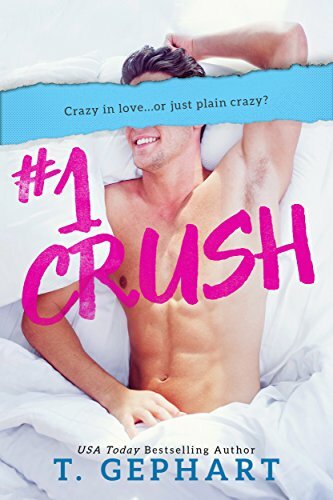 Cristina: I’m currently reading #1 Crush and it is HILARIOUS!!! Holy hell I’m laughing so hard!! Leslie: Cristina, you are really tempting me to click #1 Crush!!! This blog is very bad for my TBR’s waistline. Cristina: I cannot get over how freaking hilarious #1 Crush is!!!! Ok so confession… I sneak-read at work. I can’t help it. When I have down-time, I need something to fill it and reading via Kindle Cloud reader is my go-to, every single time. It’s my weakness, but I can’t get caught reading on company time. I even have my computer screen angled a certain way to keep people from seeing it so I can have that extra second to close the browser before they head my way. Anyways… Back to #1 Crush… the only issue with reading on company time is when I come across a book that literally has me busting a gut! You know what it’s like when you’re trying not to laugh? You laugh… much harder, and with no hope of stopping. Every single page in this book has me rolling on the floor *figuratively speaking of course, because I’m currently on the clock* laughing. Please make it stop! Cheryl: I just finished #1 Crush and I LOVED it!! Full-on laugh out loud belly laugh story. Did have a smidge of angst but great well-written story!! I’m gonna say 5 stars!! And boy does she pile them on. But it’s okay ’cause she’s hilarious the whole way through, so you don’t mind her telling the lies, either. 😉 You just know you’re in for a wild ride. And that’s okay too. ‘Cause she’s only doing it to finally get him out of her system, so she can move on with “real men” and stop wishing they were all him. …not only was Eric Larsson delicious in a way that made my girly parts tingle, he was a Hollywood movie star. Oh, and we’d never met. Yep, I know what you are thinking. I’m crazy. Wrap me up in a straight jacket and lock me away in a padded cell. Because I wasn’t sixteen anymore, and crushing on a guy I’d never been face-to-face with was tragic. After all, she’s always been told that when it comes to a celebrity, meeting them in real life is never as good as what you’ve built them up to be. Disappointment usually follows, and she’s hoping he’ll turn out to be a real jerk. There was also almost zero chance he was a nice guy. Nice guys didn’t look like that. And they sure as sh!t weren’t famous. No, I’d dated plenty of nice guys. And while it was pleasant and even enjoyable, I got bored quickly. Because obviously there was something wrong with me. Note my unhealthy attraction to a man who doesn’t know of my existence. And if that laundry list of misdemeanors wasn’t enough to convince me this wasn’t going to be a happily-ever-after, there was also the fact he had a GIRLFRIEND. It’s not like anyone knew what my purpose for flying there was going to be. And as long as I didn’t attract any attention to myself, I would be totally fine. I’d chalk it up to investigative journalism. I’d write a column about it— my covert operation— and kill two birds with one stone. It was a win/ win. Who the hell yells out his last name? I panicked, unable to tear my eyes from him as his head lifted and his eyes settled on me. Dear. Lord. In. Heaven. And. All. The. Saints. and her absolute star-struck goofiness catches his eye, intriguing him enough to find her at the party and chat her up. Oomph!!! And he’s not a jerk at all. I had been so wrong. There wasn’t a chance he was an a$$hole or rude or any other offensive stereotype I’d imagined. Hell, I was more of a diva than he was. Goddamn it. Now I liked him even more. Girlfriend, I reminded myself. A gorgeous one. I’ll stop here and let you read the rest. Between her goofy antics and internal musings, HIS best friend’s wit and sweetness, and the hotness that is Alexander Skarsgård, er… I mean “Eric Larsson” (as he’s called in the book – but yes, Alexander Skarsgård was the inspiration for this, and the author has her own personal story about meeting him), you’ll have a fun, lighthearted romance read. BUT!!! BEWARE. It does get somewhat angsty (which I was hoping for), ’cause I was certainly anticipating some sort of trouble considering… er… stuff. So I’ll say I only had two hiccups with this story as a whole. One, how quickly he positively reacted to her, and his level of interest was pretty high, right off the bat. In this instance, I would have preferred a little “harder-to-get” in regards to getting close to him (for the realistic value). And as funny as this author (and heroine) is, I would have LOVED some of that “comedic trouble” to happen before it all started falling sweetly into place. Maybe if THAT had caught his attention, finally… then I could have believed it more. And two… well. That furious part up there was good enough to get me truly, physically reacting, huffing and puffing and feeling my face get red (I expected an eventual mess… I was HOPING for an eventual mess). But to me it went a little too far, just too over-the-top for the sake of drama, and the story wraps up a little too quickly, considering. Although the drama was certainly unique. Not quite the same ol’ celebrity drama trope, so I do appreciate that. Okay y’all can come back now!!! Spoilery-feelings time is over!! Or maybe it skipped a beat. I was still breathing, so I hadn’t died. That was good. Thank you for reading, so glad you enjoyed it!! While originally intended to be a standalone, I will be expanding it into a series, Ryan and the Larsson boys will get their own books so each will be able to read independently. Great review! I agree on the furious part- could not believe him!! I wasn’t too surprised at the confession at the end-kinda thought all along that may be true!! Overall very entertaining story. I just finished #1 Crush and what a brilliant read! I loved the (you know….that part), it made my stomach ache. I thought the book was so funny and often found my self laughing out loud. I can’t wait to read Ryan’s book. A new fav author for me.